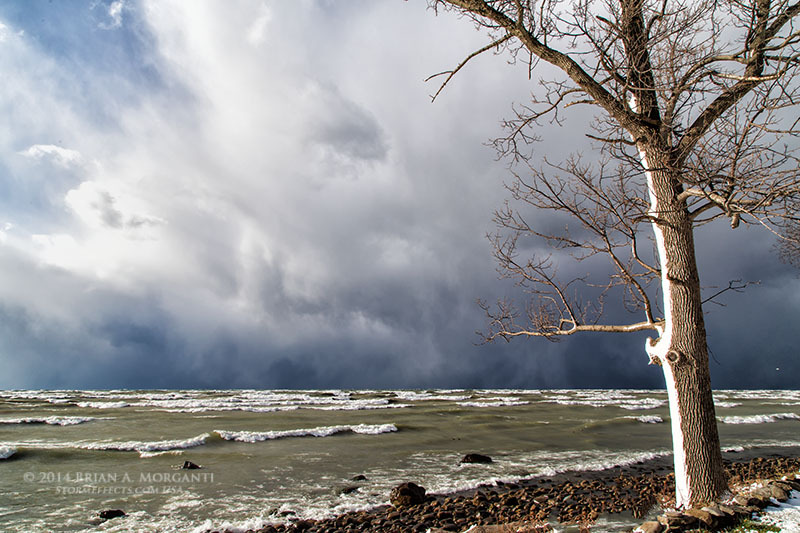 Today would be "round 2" of a significant Lake Effect snow event coming off both Lake Erie and Ontario. Some locations east of Lake Erie had already received several feet of snow two days prior and now had more on the way. That area would be difficult to get into and I was more concerned with seeing the dynamics of the Lake Effect "snow machine" forming over the lakes and then moving inland.. I opted to head directly north to Oswego & Jefferson Counties New York, which are located on the eastern shores of Lake Ontario. The forecast there was for an intense snow band to form and dump up to 5" per hour in a narrow corridor coming off the lake as it moved up the higher terrain of the Tug Hill Plateau. This is an elevated area south of Watertown N.Y. well known for receiving massive snow depths. 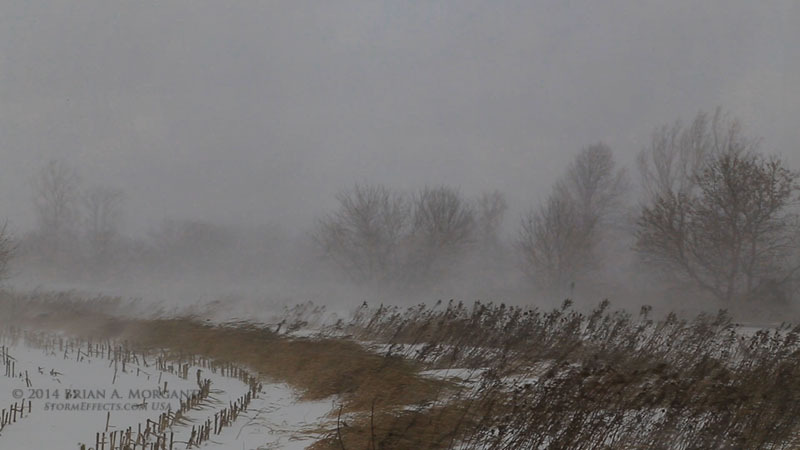 I was able to experience this band first hand with wind gusts to 50mph and white-out conditions. Before driving through the band all was well with patchy sunlit areas and only threatening skies in the direction of the snow band, much like looking towards an approaching thunderstorm. A several mile "white knuckle" drive through this band was required before breaking through into once again partly cloudy skies with little wind. Of course, I had to drive back south through this same band which was slowly drifting south. I was then able to stay just south of this band until well after sunset when I awaited its approach from along the shoreline in the fading light. First Look - Selkirk Inlet: This was my first look at the stormy skies and imbedded snow showers to my north from Selkirk Inlet a little north of Pulaski New York. 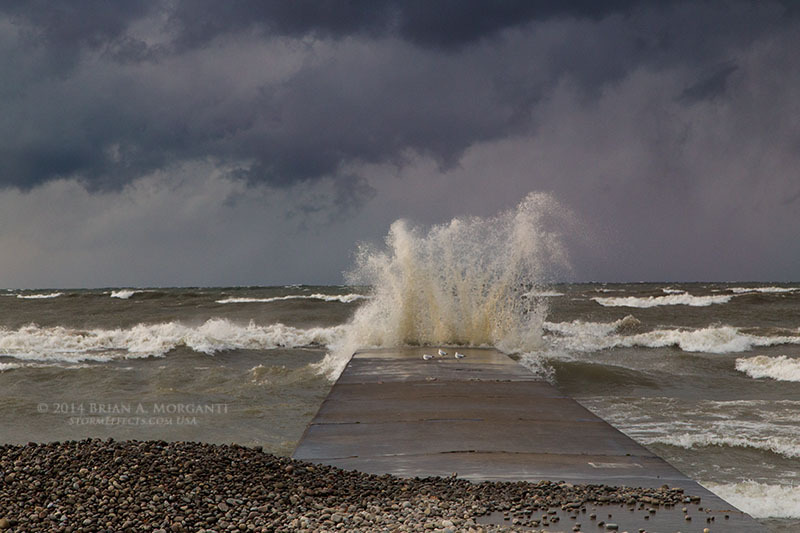 Winds were steady at 35-40mph here and the lake was being whipped into a frenzy of ocean-like waves. Sunlit Shore - Rainbow Shores: I was able to find a high spot overlooking the lake just when the sun broke though over the green waters of Lake Ontario. 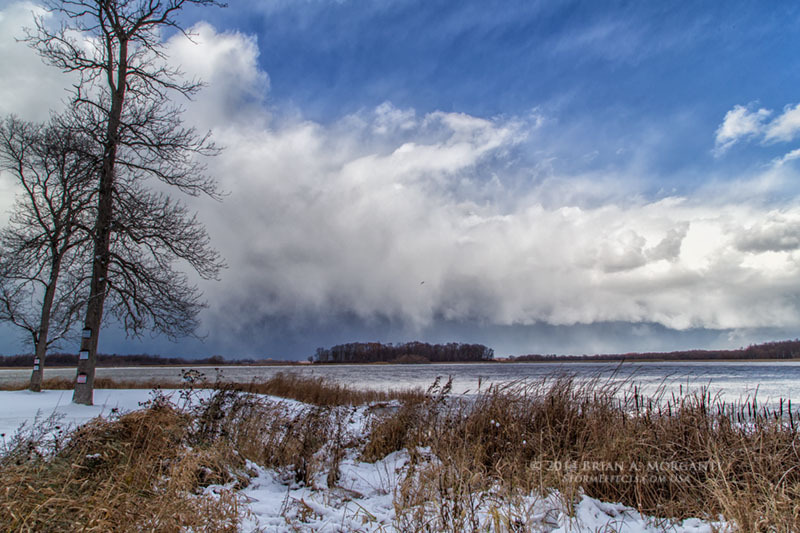 This wide angle view is looking northwest where numerous snow showers were forming about 15 - 20 miles to my north.. Developing Snow Band - Sandy Pond Road Image #2: Image #2 taken from near the terminus of Sandy Point Road looking north. Developing Snow Band - Sandy Pond Road Image #3: Image #3 was taken from from the shoreline of Lake Ontario, again looking north. South Calwell Pond: This image was captured a few miles north of the Sandy Pond Road images and is looking directly north over South Calwell Pond. Lake Ontario is located about 1 mile to the west (left) of this image. This area was a little more protected from the wind and there was at least a foot of snow in the vacant boat ramp area. 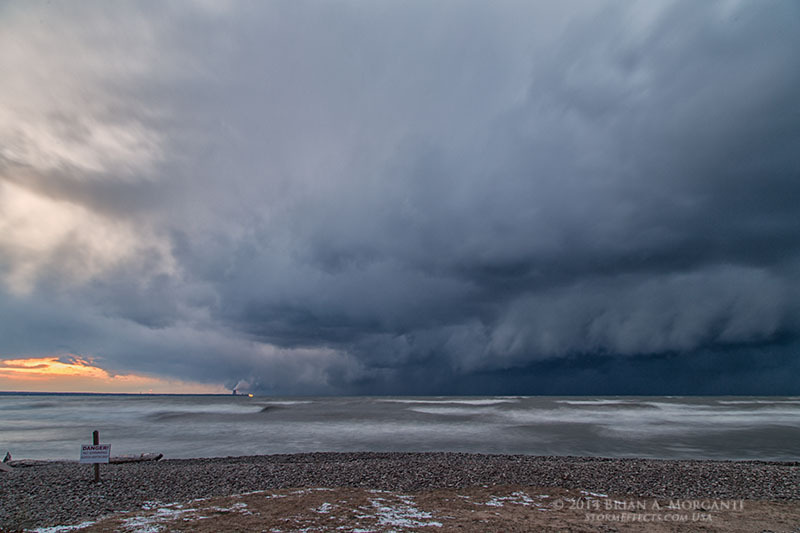 Lake Ontario Convection: This image is looking to my southwest over the lake at a new area of convective cloud development. 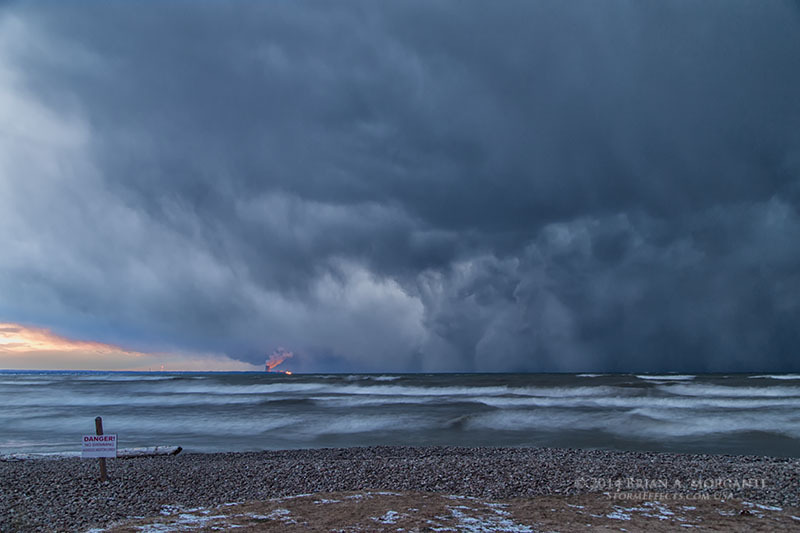 This later formed a small snow band, but the main action was still to my north as shown in the next image. Snow Band - North : At this point I am less than 5 miles from an intense snow band to my immediate north. Once these bands move inland and ride the upslope of the higher terrain they can become much more intense. Notice the wind blown snow sticking to the windward lake side of the tree trunk. Angry Lake: I again drove a mile or so north and decided to take one last look at the lake before driving through the snow band. Strong winds close to the downdraft area of the snow band were creating higher waves, much to the dismay of these resting sea gulls! Intense Snow Band - Highway 3: The winds really got cranking as I entered the snow band from the south along highway 3. I pulled off the road momentarily to shoot a little video of the near white out conditions, and grabbed this video still at a time when the trees and the foreground were still visible. The temperature dropped to about 23F at this time with winds easily gusting to 50mph. 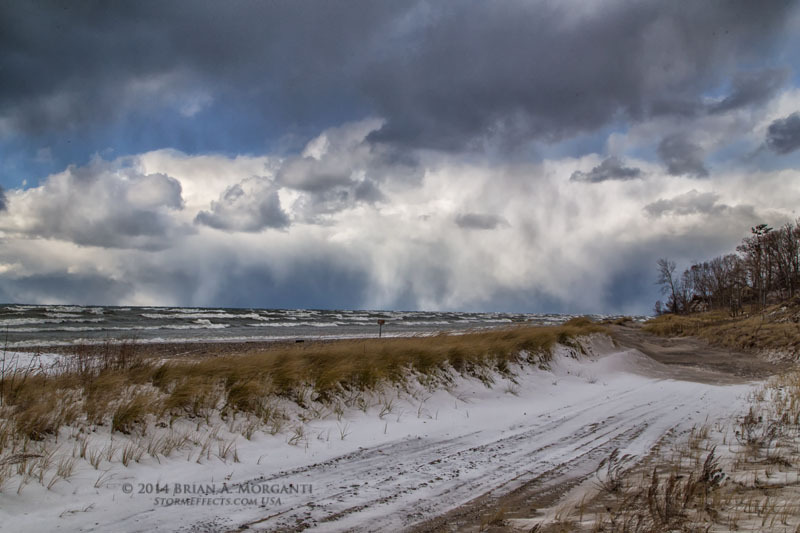 I was too busy driving after this to take any more images within the snow band. 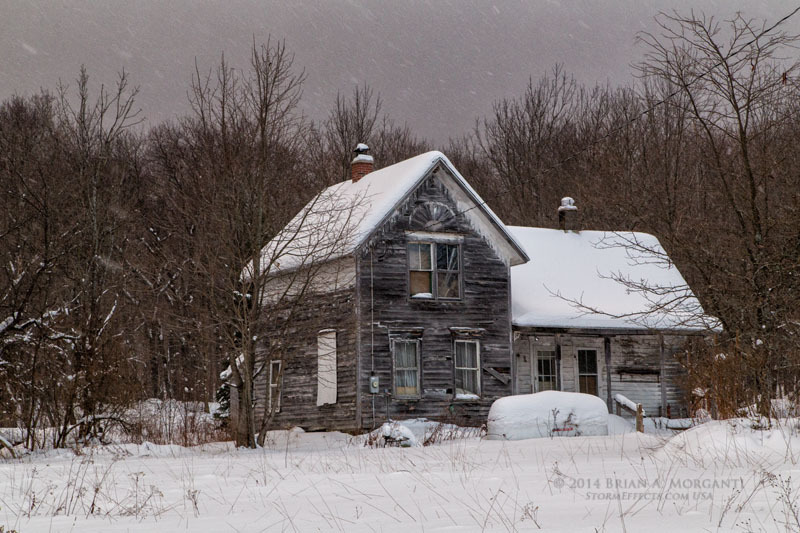 Abandoned House - Tug Hill Plateau: After driving back south through the snow band I decided to parallel it to my north and head inland onto the Tug Hill Plateau. I captured this "Christmas Postcard" scene on a dead end road at an elevation of about 1600' above the lake. The snow depth here averaged about 30", but the snow band would bring another two to three feet here during the overnight hours. 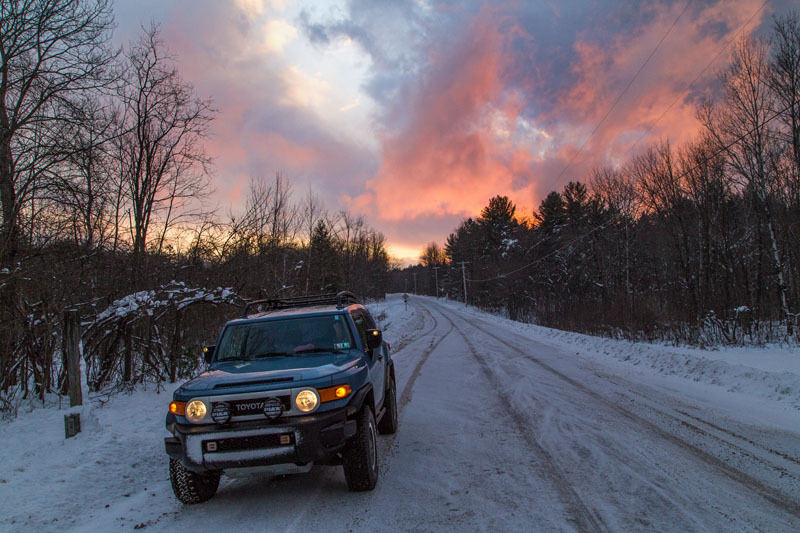 Sunset Skies - Tug Hill Plateau: I grabbed this image of the "FJ" and the colorful skies at sunset before blasting back to the open skies above the lake. 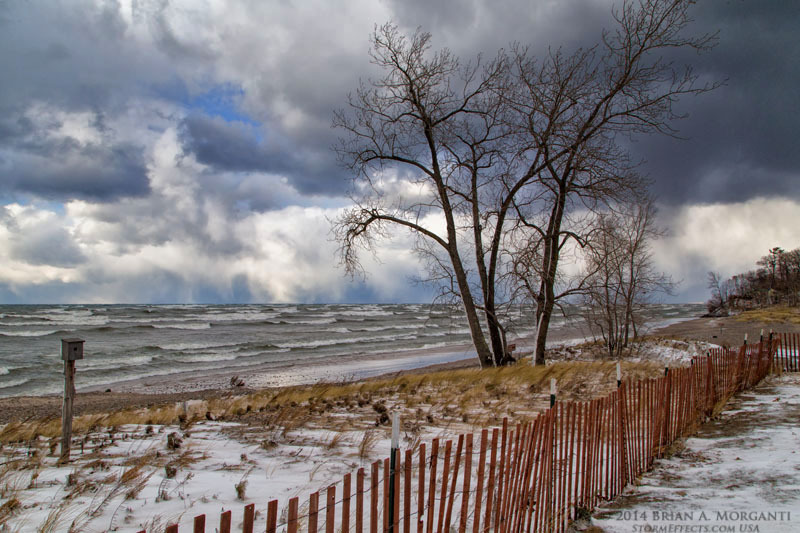 I knew I would be too late for the colors, but still hoped I could capture an angry sky over the lake from the intensifying Lake Effect snow band as migrated southward. Approaching Snow Squall - Selkirk State Park #1: The sun had already set, but I was able to take a tripoded shot of the approaching snow band with its shelf-like structure as it rapidly approached from my WNW. 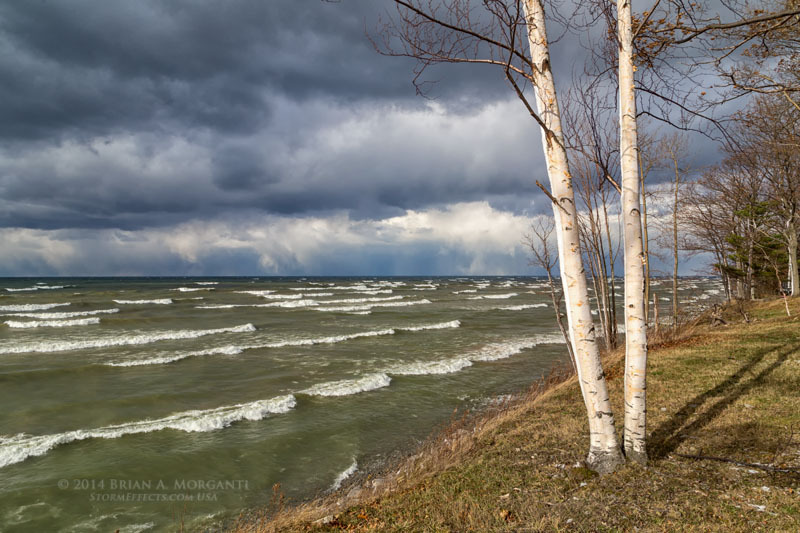 Approaching Snow Squall - Selkirk State Park #2: This image was taken several minutes later from the same location a little southwest of Pulaski New York. 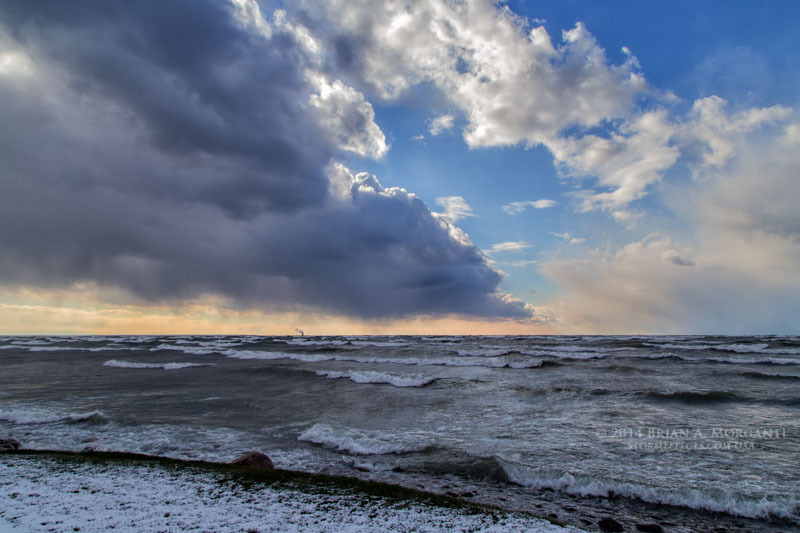 The white bands of the snow are fast approaching and the winds once again began to intensify as a curious funnel shape descends to the lake. 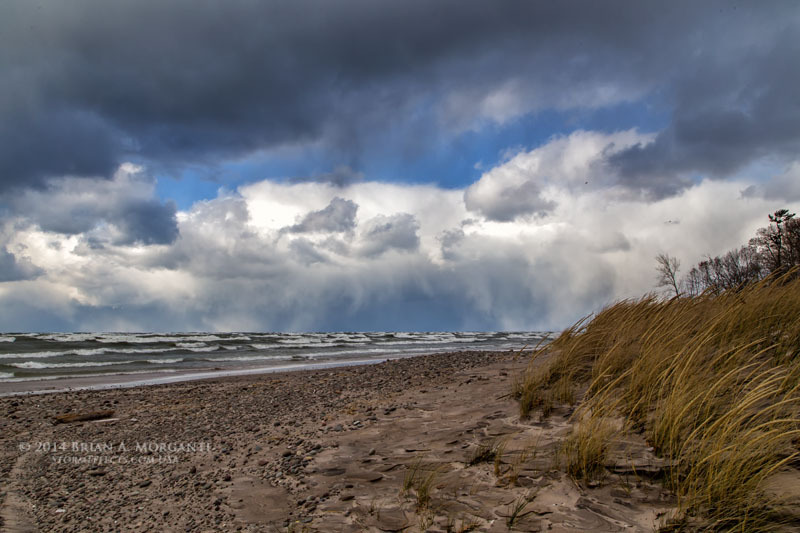 Approaching Snow Squall - Selkirk State Park #3: Looking west, this was my last image of the day only moments before the snow band overtook my location. An awesome scene and dang if that doesn't look like a "snow-nado" wrapping up! 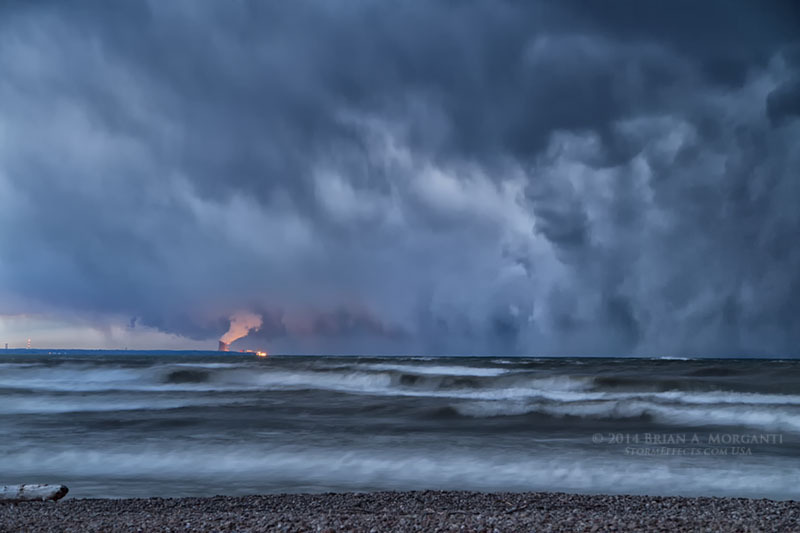 The Nine Mile Point Nuclear Generating station located northeast of Oswego NY can be seen to my WSW.